Launching Greylock Arts in Adams, Mass. 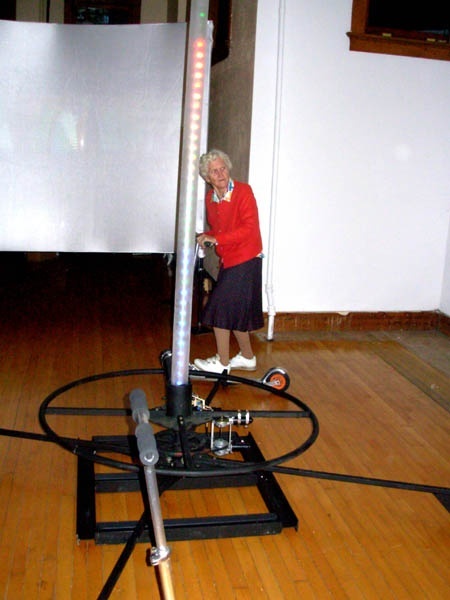 Marianne Petit teaches at New York University's Interactive Telecommunications Program from which Matthew Belanger is a graduate. Giuliano photos. The GreylockArts storefront window features a Solar Bikini by Andrew Schneider. 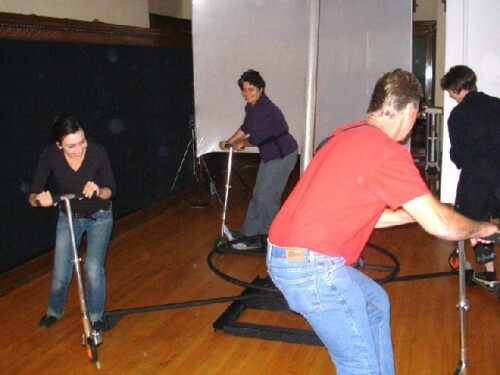 Going round and round on the Krinkle-O-Tron. This feisty senior took a spin. The jewelry lights up at night. The Solar Xylophone emits a random play of notes. (Photo courtesy of GreylockArts). 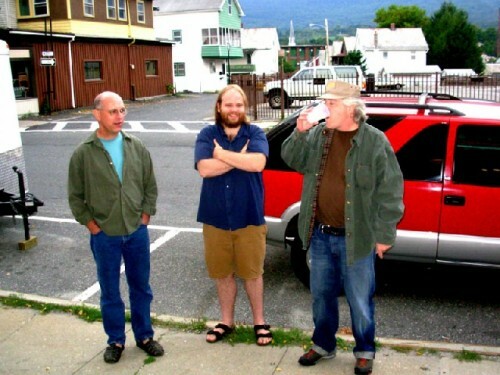 Belanger takes a break from the opening with the artists, Larry Alice, left and Jeff Hudson from the Eclipse Mill. From the top floor of their brick, industrial building, at 93 Summer Street, in the downtown business district of Adams, Mass. the artists, Matthew Belanger and Marianne Petit, can see Mount Greylock, the tallest peak in Massachusetts. Back in the day their location placed them in the midst of a bustling business district in walking distance of three Roman Catholic churches in what still is a Polish neighborhood. Today, there is little or no traffic on the street with only a handful of stores struggling to survive. There have been decades of talk about economic relief for the hard hit Northern Berkshire community, including developing Greylock Glen. But mostly, just talk. Even former governor, Jane Swift, a native of the area, couldn't get a project off the ground. Overall, Adams is a lovely town. Particularly now with such grass roots arts developments as their Greylock Gallery and Topia Arts which is still in process of becoming a reality in a former movie theatre. When the artists moved in a year ago they were excited about the potential of the elegant storefront of their home which was formerly a clothing store. It has a vintage oak interior with classic tin ceiling. They are trying to adapt the space for exhibitions while not disturbing the unique architectural detail of their landmark building. So what we find here is not the usual white cube of most contemporary galleries. Actually, there is very little that is conventional or predictable about GreylockArts. It is certainly not a gallery in the usual sense. Given the highly experimental, technological work that they present it is unlikely that their exhibitions are intended to make sales and generate income. It is better to approach their concept as a Project Space or independent Kunsthalle. It is a grass roots effort sustained by their own resources, the cooperation of the artists they present, and lots of sweat equity. There are minimal resources for marketing so mostly people come to them by word of mouth and media coverage. It helps that the local weekly, The Advocate, gave them a nice spread as has the daily North Adams Transcript. That kind of visibility helps but during the opening of the current exhibition "Sustainable Energy Art" many of those attending were artists from the nearby Eclipse Mill in North Adams. Similarly, the couple has been visible at local gallery openings and active in the arts community. GreylockArts will be participating in the North Adams Open Studios events planned for the 12th of October weekend. The couple is connected to the New York University Interactive Telecommunications Program. Matthew is a graduate and Marianne teaches in the program. The artists whom they show frequently are connected with NYU as faculty or graduates. So there is a very specific bias to the kind of work that interests them. In any location, and under the most ideal circumstances, it is work that is unfamiliar and generally a tough sell. But also reflects the tech based obsessions of their generation. One of the advantages of having a storefront location with limited hours, on a less than busy street, is that one can just drop by and see several pieces in the windows which jut out, flanking the recessed doorway entrance. One of the works "The Solar Bikini" on a mannequin, by Andrew Schneider, is bound to stir up a fuss with the locals. The brief swim wear is retrofitted with 1 x 4" photovoltaic, film strips sewn together in series with conductive thread. The cells terminate in a 5 volt regulator into a female USB connection. In theory that's enough power to run her iPod just as long as she opts not to get wet which might prove to be quite shocking. It is certainly a novel conflation of fashion and renewable energy. Which is a unifying theme in the works on view. Also displayed in the window are "Wallflowers" by Megan MacMurray and Angela Pablo. They have cut flower shapes adhering to the walls using recycled plastic shopping bags. Normally this material gets tossed into landfills where it may biodegrade over the next million years or so. But here it has a second life as works of art. 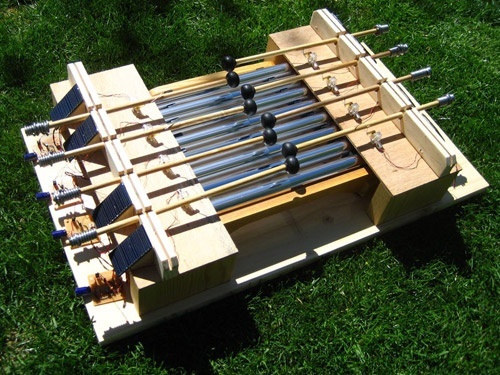 The "Solar Xylophone" by Rory Nugent is a solar powered, solar controlled, autonomous, musical instrument. The xylophone was designed with hopes of using renewable energy as a responsible way of powering the piece but also as a powerful theme to drive its artistic elements. It plays whenever sun is available with an unpredictable string of notes. So that is certainly stretching the notion of music in a manner that might have interested the late John Cage and his use of "chance operations." 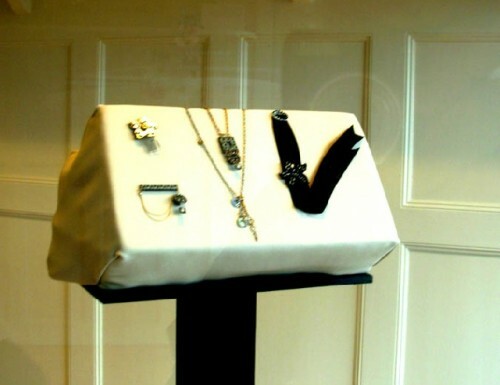 Also in the window passersby may view the Solar Jewelry of Leif Krinkle, Alice Planas, Hatti Lim and Meridith Silverman. Again, the small wearable pieces entail means of storing solar energy during the day and producing illumination by night. Recently, an MIT student, Star Simpson, wearing a similar piece of jewelry was arrested at gun point while attempting to board an airplane at Boston's Logan International Airport.. It appears that the world, or at least Homeland Security, is not ready for such techy wearable art during a time of threats of terrorism. So, GreylockArts, welcome to the neighborhood. Or did I mean Global Village. "I have known Marianne since the 1980s. Her work has always been amazing, as is her incredible creative energy. What a wonderful project."